God loves us and let bad things happen in due course, giving us the opportunity to learn from mistakes and live a better life. I learned an important life lesson from a “pain-removing process”. The lines of a varied, adventurous, complicated and challenging life story are imprinted on this quilt. The red flowers on the quilt represent happiness and the white flowers represent both physical health and mental health, which not only should be co-existed in harmony, but also the goal for everyone. I hope all my friends are healthy and happy like the red and white flowers. Everybody knows that health leads to happiness. However, my conception of this idea was reversed. I wished everyone was happy even I had to sacrifice my health. During TIQE2012 (Taiwan International Quilt Exhibition 2012), Sue, Mary and Misik told me that I looked exhausted. That’s true, but I was still keen on accompanying with all the artists till they left Taiwan. In fact, I was facing the crisis of heavy bleeding. Only my husband and daughter knew it, so they shared my works. Until this year, after several visits to Europe, I finally had to do the surgery. My preconception “grew” the tumor up. I am lucky enough to be able to choose the time for surgery. Who has such courage to accept this kind of life crisis? Thanks to my husband and family for the huge and selfless support of my dangerous “experiment”. Thank God for guiding me through this life challenge. I will put health and happiness in my first priority from now on. This is a story of a stupid adventure. 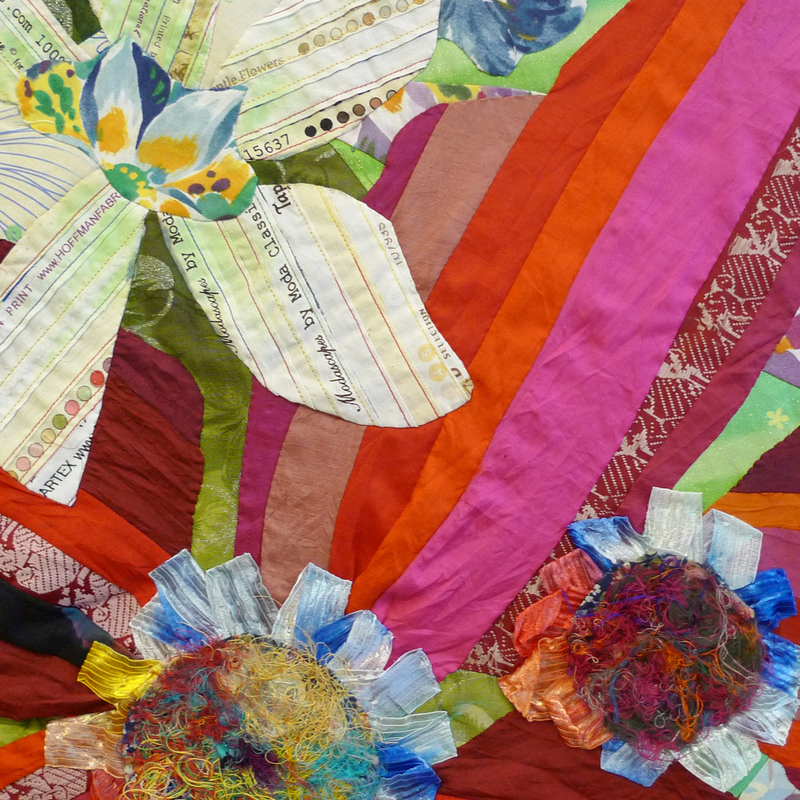 After I overcome my ignorance, this story will “bloom” like bright flowers in this quilt. I’m glad that I still have enough time to sew it after the surgery without delaying the deadline. Everything is going well and I truly appreciated. I wish everyone healthy and happy forever. This is a wonderful quilt. I'm so happy you are feeling better. Taking care of your health is so important. Good health and happiness to you, too. Thanks for sharing you journey...a beautiful piece and message too. A reminder to all of us of what are the most important things in our lives. What a beautiful quilt and even more beautiful sentiment. Thank you for sharing your heartfelt journey with us! I am so glad to know you are recovering and focusing more on yourself and your health. Hsin-Chen, I hope you are fully recovered and finding the harmony in life. Such a difficult and fleeting balance. Your piece is wonderful and reminds us to take good care of ourselves as well as others! I am glad you have the support of family. Thank you all! I’m getting much better now. I’m glad that I can meet the deadline. But to be honest, I didn’t have enough time to finish hand-quilting. Sorry for that… Wish everyone all the best! This piece is filled with your vitality, Hsin-Chen, from the striking color palette to the dramatic placement of petals. I am happy that you are focusing on your health and send you good wishes for continued progress. Thank you, Mary. Health is very important. I like your quilt, too. It's beautiful. Take care and enjoy creating! Hsin-Chen I was upset to read of your health issue and wish you a speedy recovery and harmony in your life. These bad times make us remember and celebrate the good times of our lives and what is most important to us. Your quilt is a testimonial to this. Thank you, Sue. “These bad times make us remember and celebrate the good times of our lives and what is most important to us.” I love this sentence and it’s so true! 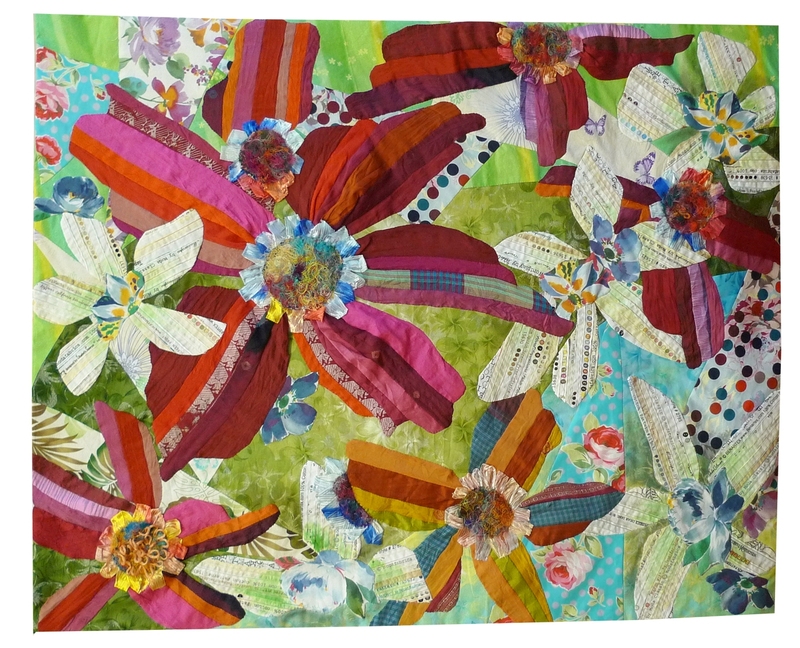 When we overcome the bad things, we will see the good results, just like the bright flowers in my quilt. I’ll take good care of myself. Thanks again! I love your quilt of this challenge! It’s stunning!